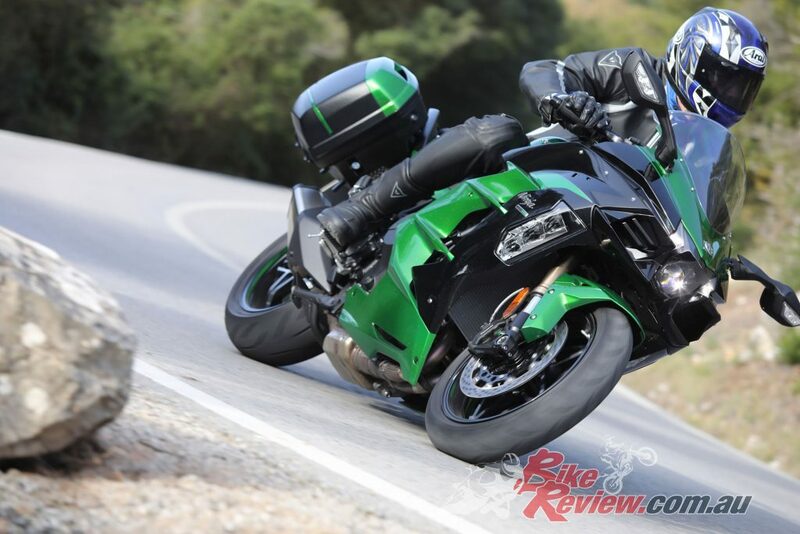 World Launch: 2018 Kawasaki Ninja H2 SX SE First Ride! There’s no experience in motorcycling quite like blasting along a twisty road in the hills near Lisbon in Portugal on the Ninja H2 SX. 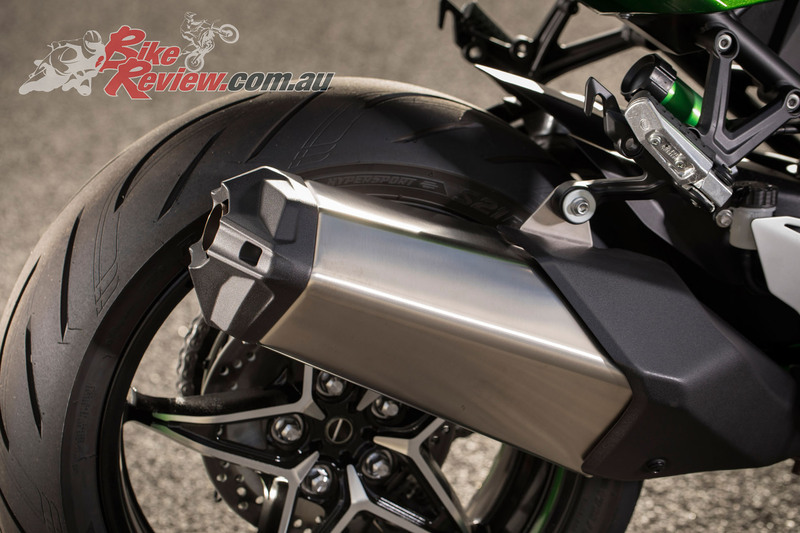 Exiting the mostly slow turns, Kawasaki’s supercharged sports-tourer responds with admirable smoothness to a twist of the throttle, feeling notably more controllable than the outrageous Ninja H2 (review here) from which it’s derived. The H2 SX SE is smoother and easier handling than the H2, carrying it’s heft 260kg very well through the twist and tight hills out of Lisbon, Portugal, on the Bridgstone S21 tyres. 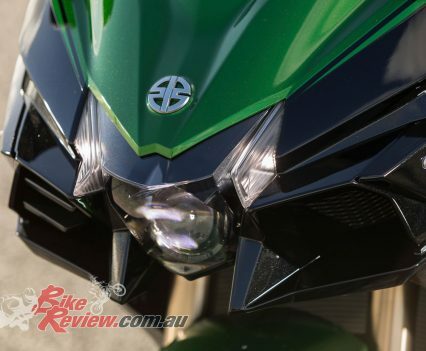 Yet once its boost gauge gets moving, the SX catapults forward hard enough to drain my blood to my boots and make its front wheel feel almost permanently light. That’s until I shut off for the next bend, and the Ninja slows with a distinctive fluttering sound from its fast-spinning supercharger. 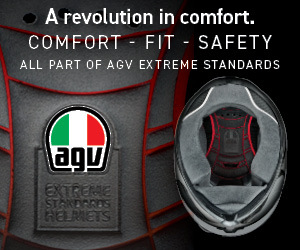 The H2 SX SE comes with Givi panniers large enough to hold a full face lid. 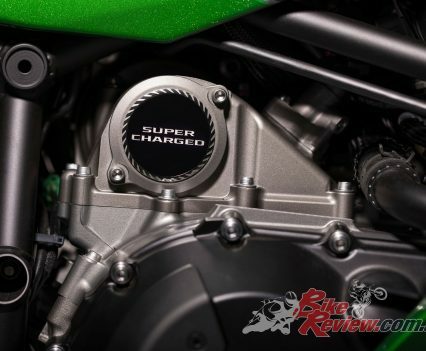 While the Ninja H2 was an exotic, no-expense-spared sporting flagship designed to showcase its forced-induction technology, the H2 SX is the first stage in Kawasaki’s attempt to bring supercharging to the masses. The firm certainly has form in developing successful sport tourers. 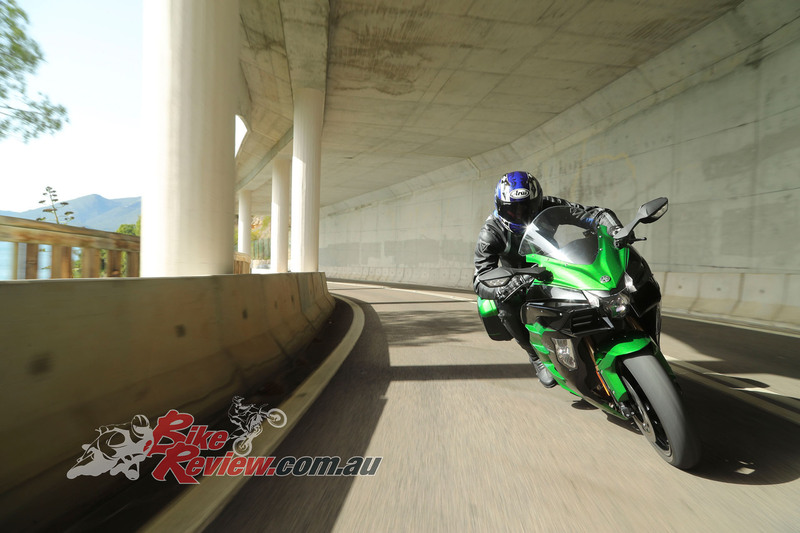 Eight years ago, the naked Z1000 (review here) was tweaked and given a fairing to create the versatile Ninja 1000 (review here), which was a hit and has remained popular ever since. This new SX is versatile too, albeit much more powerful and firmly on the sporty side of sports touring. 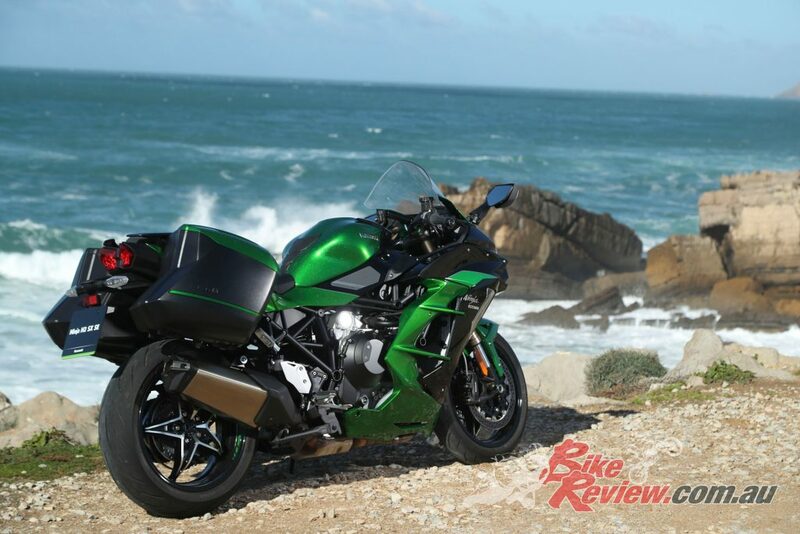 Despite being detuned slightly from the Ninja H2, it still makes a claimed 197bhp. It has a more relaxed riding position, provides more wind protection, and is designed to be more economical and cooler-running as well as more comfortable. The H2 format of 998cc, DOHC four-cylinder engine and tubular steel trellis frame is retained, but major components are new. The engine is tilted forward in the frame, whose main tubes are larger diameter, for extra strength, and reinforced with extra tubing at the rear. 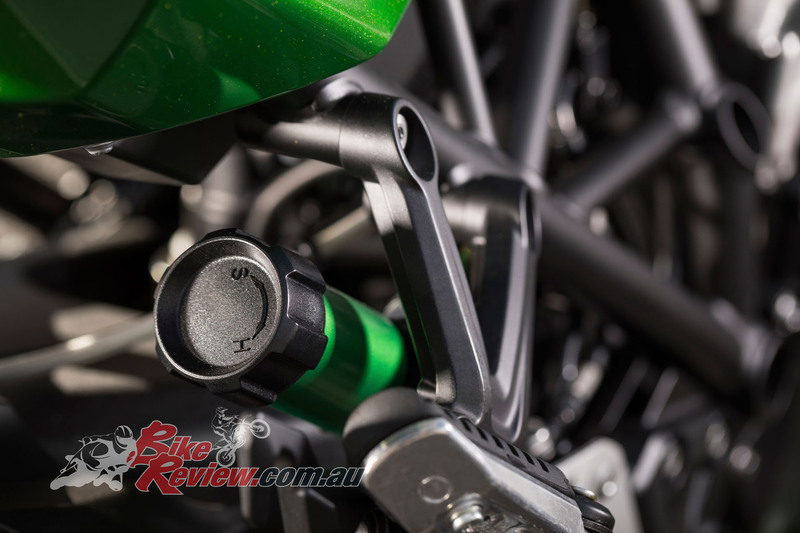 The steering head is moved forward to add steering lock and increase wheelbase, which is also stretched by a longer single-sided aluminium swingarm. 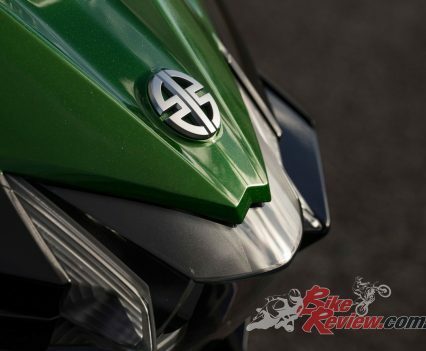 The SE will be around 20 per cent more expensive than the standard version and comes with heated grips, cornering headlights, machined wheels, two-way quickshifter and a centrestand. New engine parts include camshafts, crank and cylinder-head, as well as the supercharger itself, whose impellor blades are angled slightly less steeply. The aluminium airbox is smaller, and intakes are narrower. Compression ratio is actually higher (11.2:1 from 8.5:1), which project leader Hiroyuki Watanabe says helps improve combustion efficiency and therefore reduces fuel consumption. 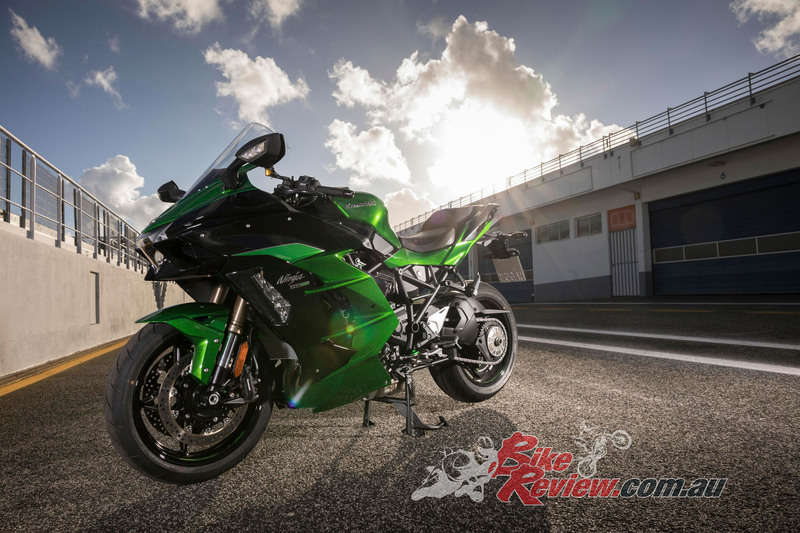 The engine has revised camshafts, crank, cylinder-head, supercharger impellor blades, airbox size and the compression ratio is raised over the H2 to improve combustion efficiency and fuel efficiency. 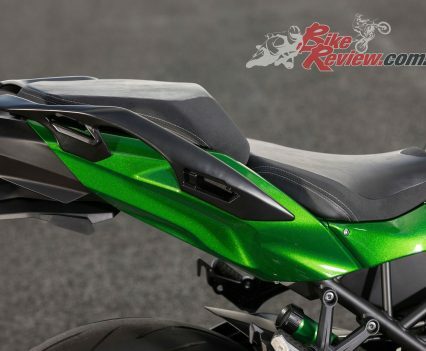 That can only be a good thing, although you’ve only got to climb aboard the fairly low seat, reach forward to clip-ons that rise above the top yoke, and start the engine to hear its menacing, gravelly rumble to get the hint that this bike is best at going fast, not saving fuel. 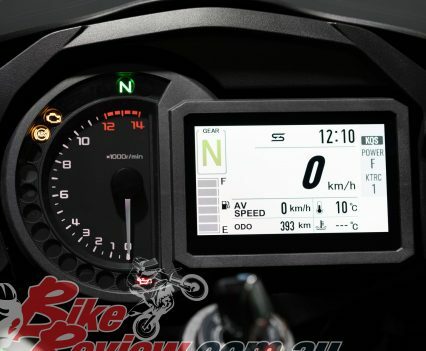 Its rider’s view, in the case of the H2 SX SE launch bikes, is of a fairly low screen (though it’s slightly taller than the standard model’s) and a TFT display alongside a rounded, analogue-style tacho. 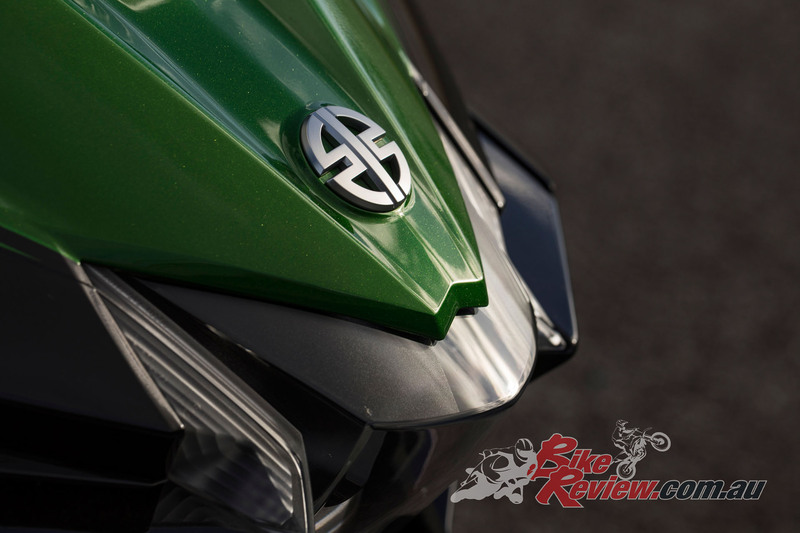 The SE, which is about 20 per cent more expensive than the standard model in most markets, also comes with heated grips, cornering headlights, machined wheels, a two-way quick-shifter and a centre-stand. 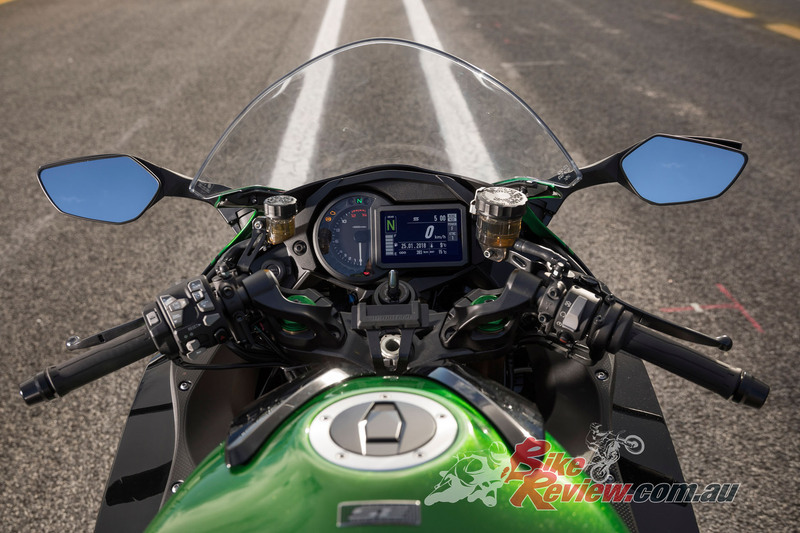 Both models also have cruise control as standard, but the H2 SX doesn’t follow the Ninja 1000 in having an adjustable screen, and there’s no wind protection for the rider’s hands. The H2 SX felt slightly vague in tighter bends but the plush suspension gave excellent ride quality, however, as expected the bike felt most at home on flowing main roads, where it was very stable. On a cold Portuguese morning I was glad of the SE’s hot grips, but less impressed by the wind noise on a brief stretch of highway, which some simple screen adjustability might have helped reduce. 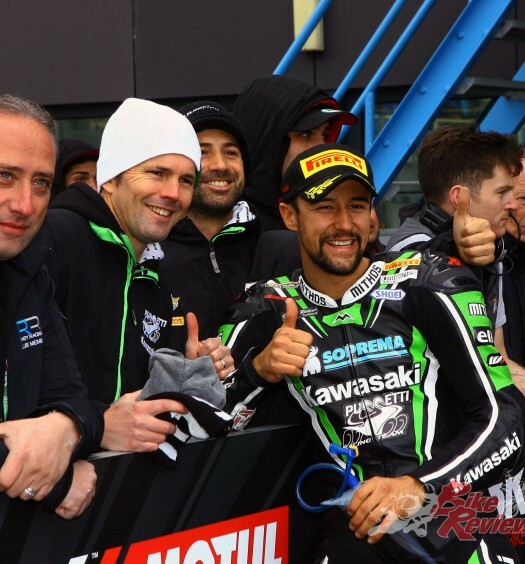 (Watanabe says that such a fast bike would have required a very strong and therefore heavy system.) 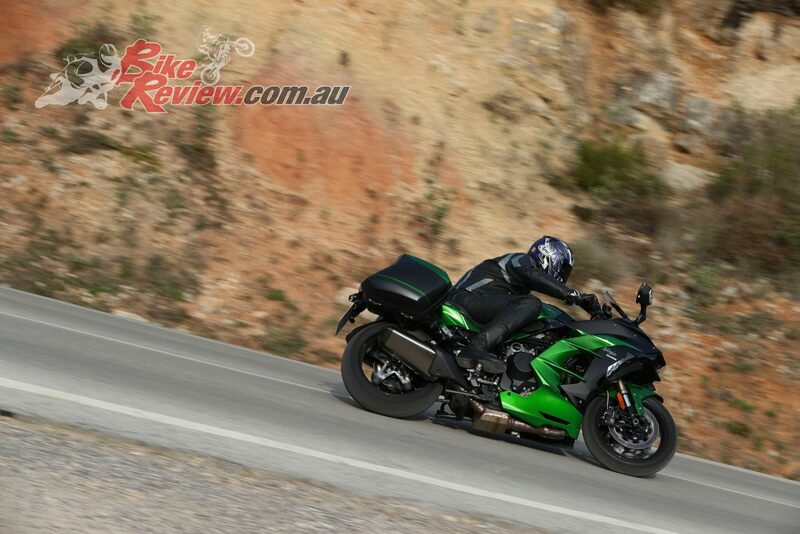 But my most vivid impression was the smoothness of the throttle response, in contrast to the abrupt Ninja H2. The SX was infinitely easier to control, pulling strongly from low revs, kicking harder in the midrange as its boost pressure rose (from the standard 100 per cent on the display), and going ballistic at around 8000rpm. Acceleration from there towards the 12,000rpm redline was jaw-dropping, and I was glad to be able to click through the box with the aid of the reliable shifter as the Kawasaki tore super-smoothly forward with as much force as a ZX-14. It slowed hard too, thanks to radial four-pot front calipers biting 320mm discs, albeit with the ABS system kicking in slightly earlier than some Bosch set-ups do. Perhaps that was partly because the front Bridgestone S21 doesn’t have the grip of super-sticky rubber, although both tyres were fine in bends, even on a few footrest-trimming laps of the Estoril circuit. The front brakes are impressive but ABS kicks in earlier than some systems do. 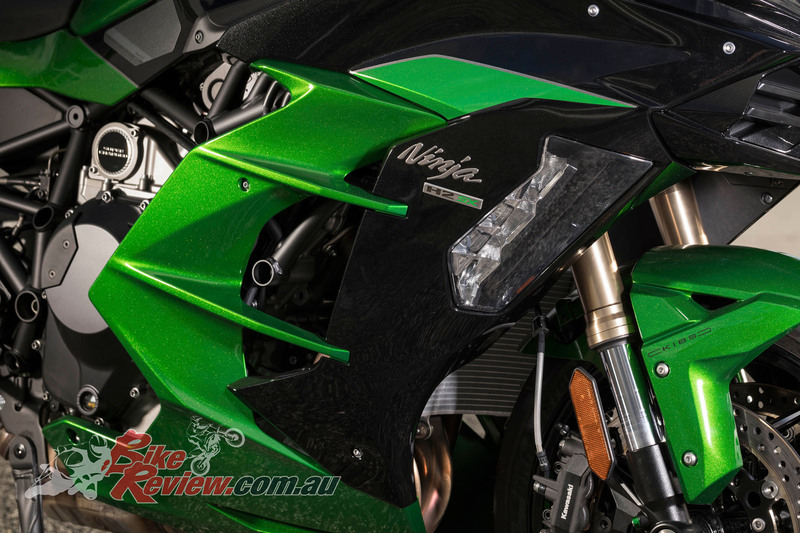 The Ninja felt slightly unwieldy on track, though only as much as you might expect of a sports tourer that weighs 260kg with fuel, so is 9kg lighter than the ZX-14, and has suspension designed as much for comfort as control. The fuel is shut off rather abruptly when you close the throttle, which can result in some pitching. The same was true on country roads, where the bike covered ground rapidly but felt slightly vague in tight bends. The engine is strong and smooth to 8000rpm where it goes ballistic. From there to 12,000rpm the H2 SX SE acceleration can only be described as completely jaw dropping. 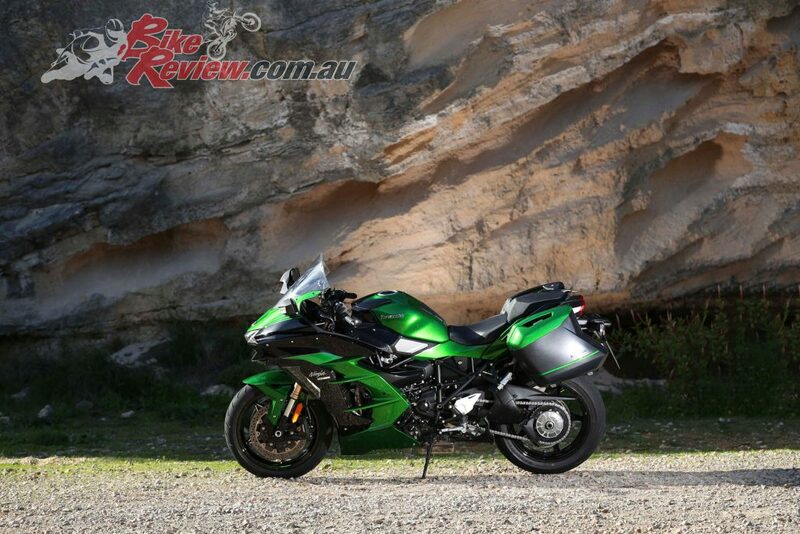 As a high-speed roadburner it has much more than performance to offer. 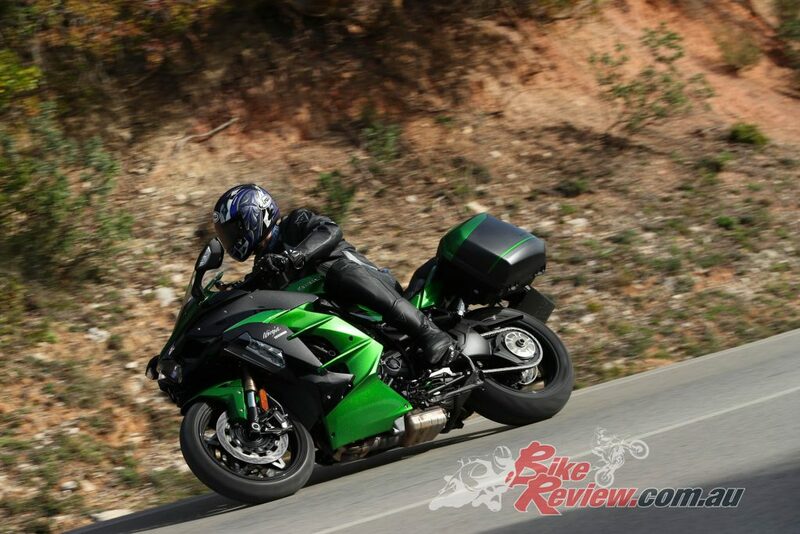 Its riding position is slightly more upright than the ZX-14, and respectably roomy. The two-part seat seemed pretty comfortable, despite being fairly thin and usefully near the ground. 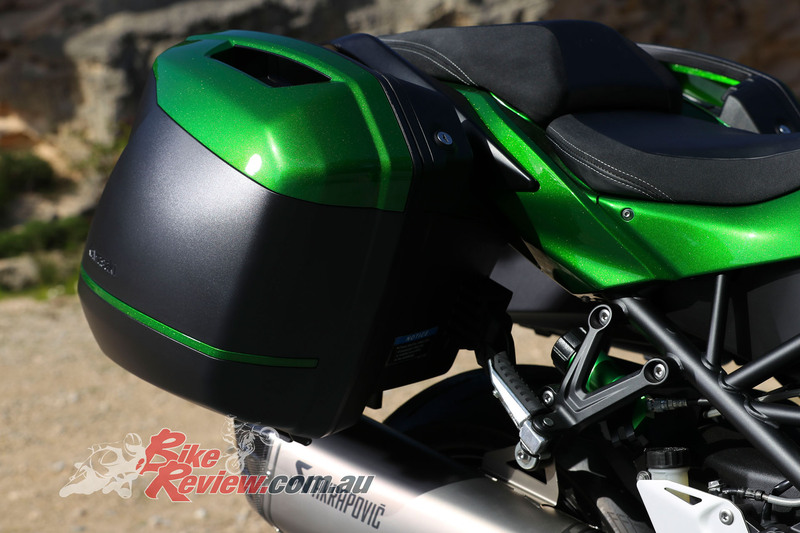 A pillion gets two strong grab-handles, plus room in the accessory panniers that each hold a full-face lid. 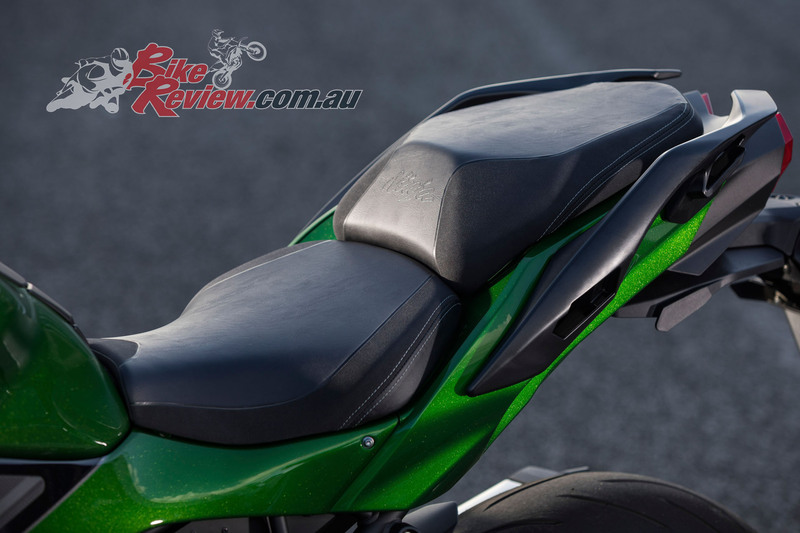 Practicality could be enhanced by a respectable range, depending on how the bike is used. 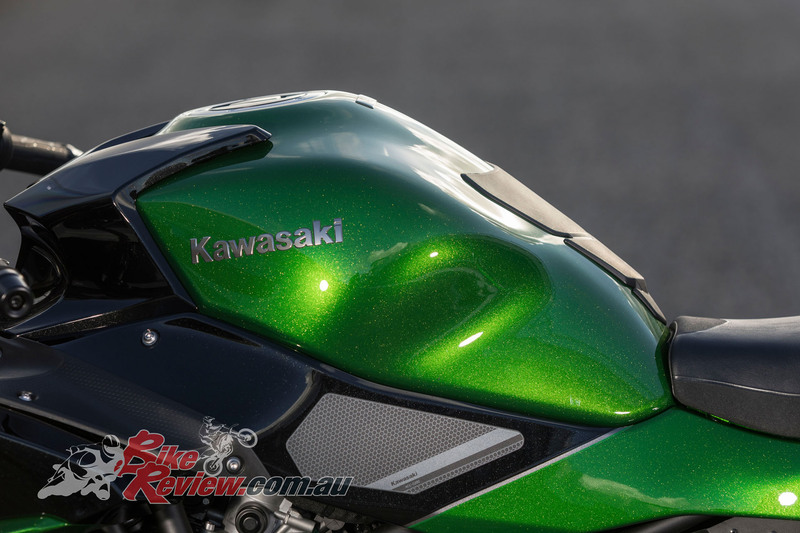 Kawasaki say it’s more economical than the ZX-14, almost matches the Versys 1000 and that its homologation economy of 5.8l/100km means the 19-litre tank is good for a range of over 300km. That might well be true, and some riders were getting better than 7l/100km on the launch. But my enjoyment of nailing the throttle and being hurled back into the seat at every opportunity brought consumption under that figure, and under 10l/100km at times, so you can’t expect to use all that supercharged 200bhp performance and not burn plenty of fuel. Which is surely fair enough. 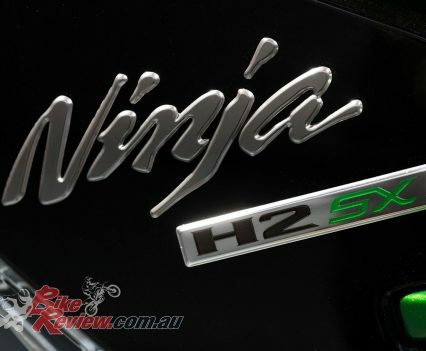 At least the Ninja H2 SX gives the option of a reasonably sensible ride or ballistic craziness, depending on its rider’s mood. 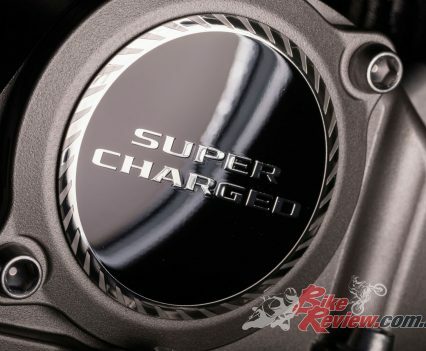 Whether the H2 SX brings supercharging to the masses remains to be seen. 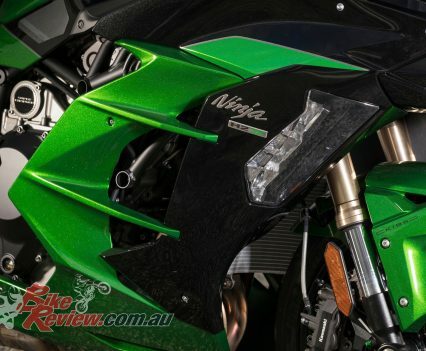 The Ninja 1000 is more practical, less expensive and still fast enough for most riders. But it doesn’t drain your blood to your boots in the same way when you crack open the throttle, or make that addictive fluttering sound when you close it. 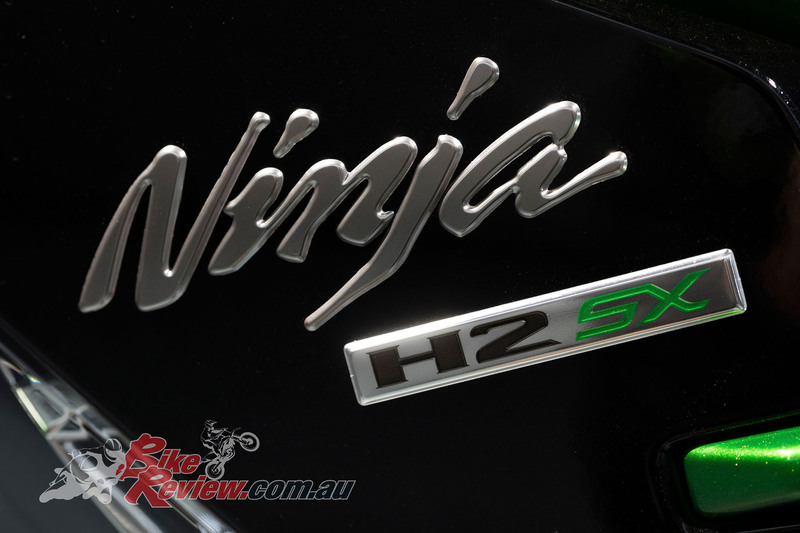 If you want the Ninja H2 experience with panniers, only the Ninja H2 SX delivers. 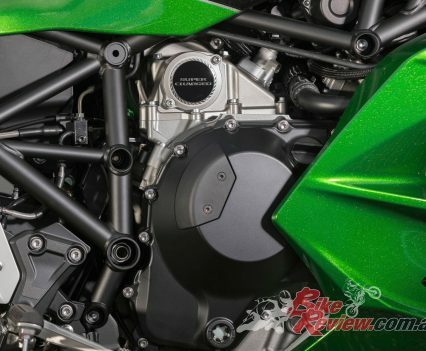 For the new Kawasaki H2 SX and SE version, the powerplant has seen numerous updates, with Kawasaki going as far as to say it’s practically all new, with a new impeller and intake system, as well as new pistons, cylinder head, cylinder, crankshaft, camshafts, throttle bodies, exhaust and revised gear ratios. In total the new engine and exhaust system is 3kg lighter than that of the H2. 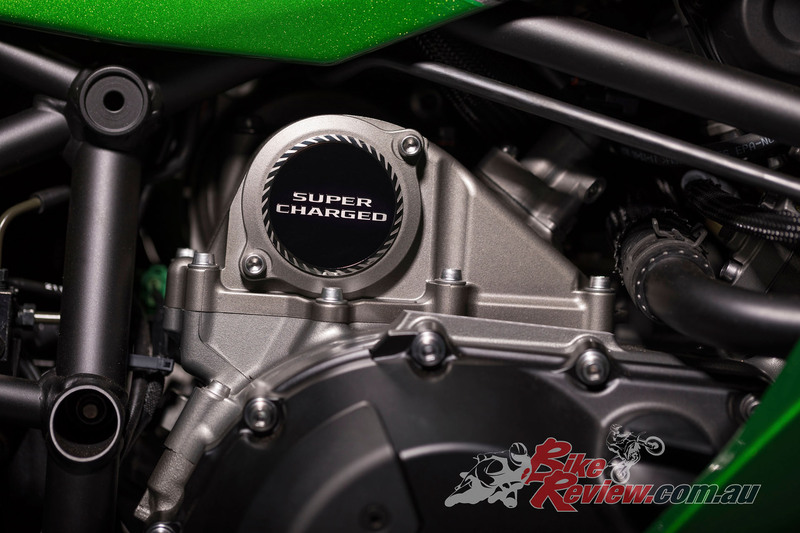 Airflow is approximately 80 per cent of that on the H2, with Kawasaki boasting 25 per cent better fuel economy than the H2, with better thermal effeciency and a raised compression ratio. Compression has been raised from 8.5:1 to 11.2:1, with a smaller squish of 1mm from the H2’s 4mm also contributing to combustion and helping prevent knocking. 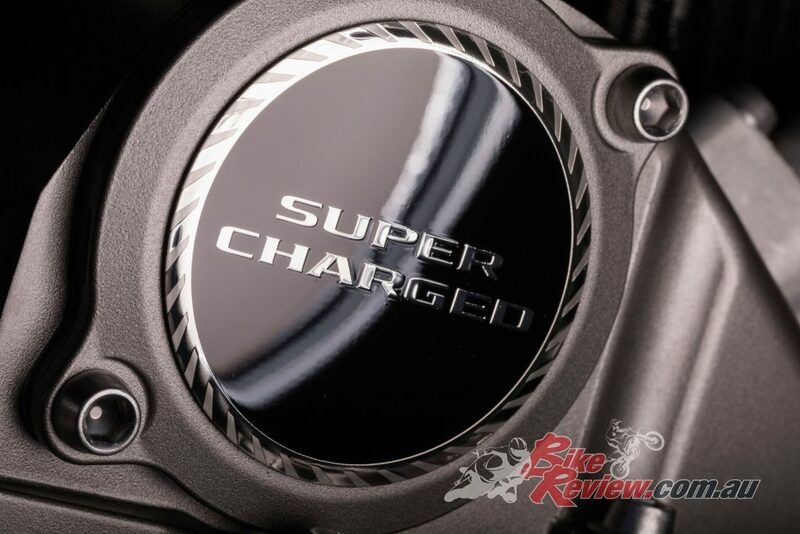 The supercharger impeller is formed of a forged aluminium and measures 69mm across. 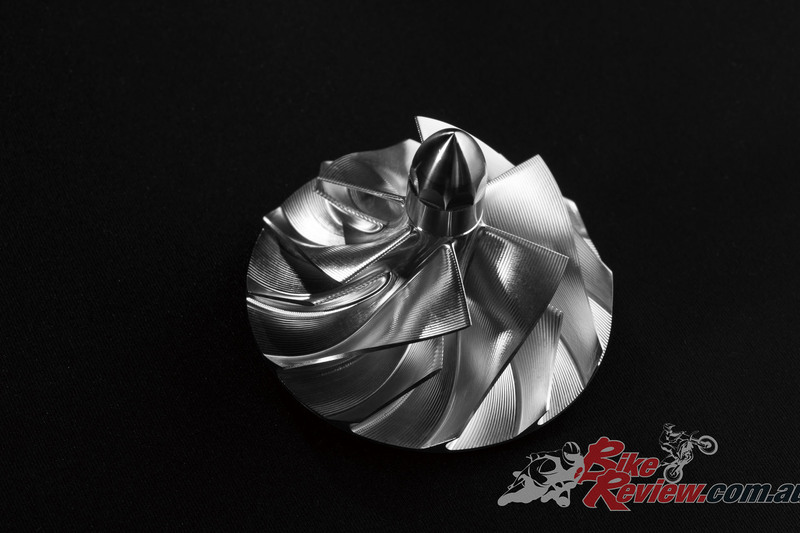 The supercharger impeller is formed of a forged aluminium block using a five axis CNC machine, and measures 69mm, while six blades at the tip expand into 12 by the base, with grooves assisting airflow. The supercharger is sdriven by a planetary gear train off the crankshaft, and inceases the impeller to 9.2 times the crank speed. The intake chamber is also designed for effeciency, and is made of rigid aluminium, now die-cast to reduce weight, instead of gravity cast. A new diffuser has also been added, while intake funnel lengths are further optimised for low to mid-range performance, with uneven lengths. Funnels one and four and shorter than two and three. 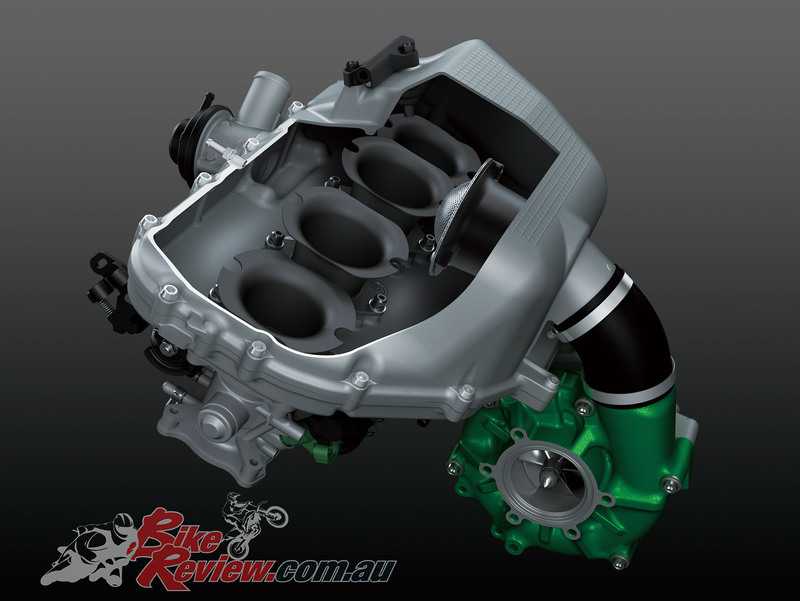 The H2 SX features a smaller intake chamber which is die-cast, and runs cooler and more effeciently. 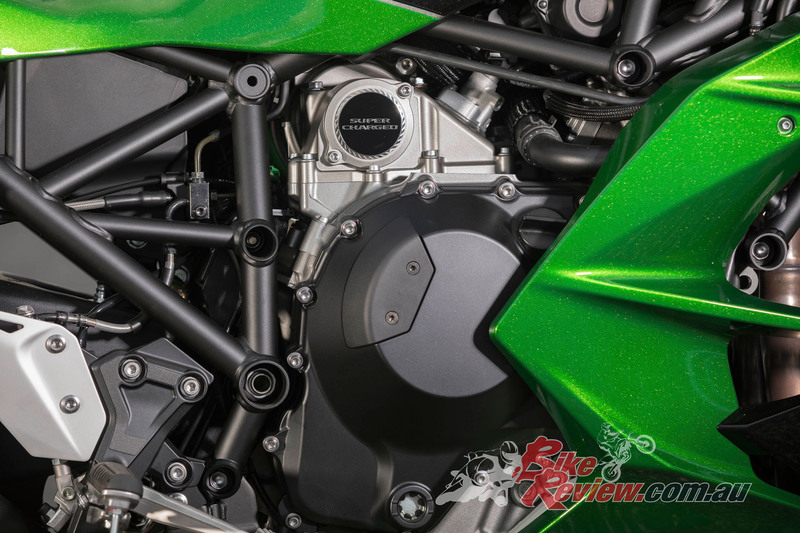 Kawasaki also boast the valve operation response is improved from the H2, with a ECU controlled blow-off valve regulating pressure, particularly on sudden throttle closes. Smaller diameter throttle valves, now 40mm from the H2’s 50mm, assist low to mid-range torque and effeciency. 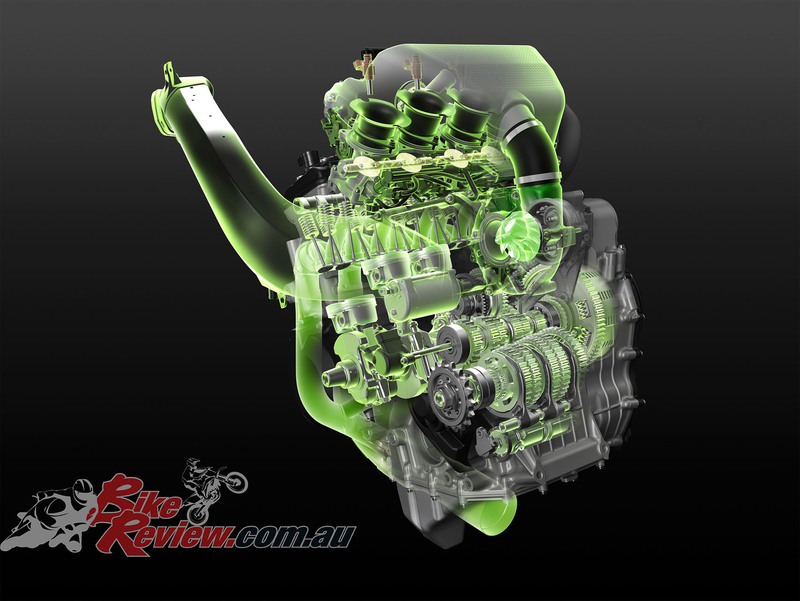 A two stage maching process is used for the cylinder head, developed for the ZX-10R, to form the throat of the intake ports, with the valve seat area bored twice, a second time for the valve seats, and offering smoother intake airflow. Cam profiles offer a shorter intake (-8 degrees) and exhaust (-12 degrees) duration (and shorter overlap), with revised intake and exhaust ports to match the lower airflow. 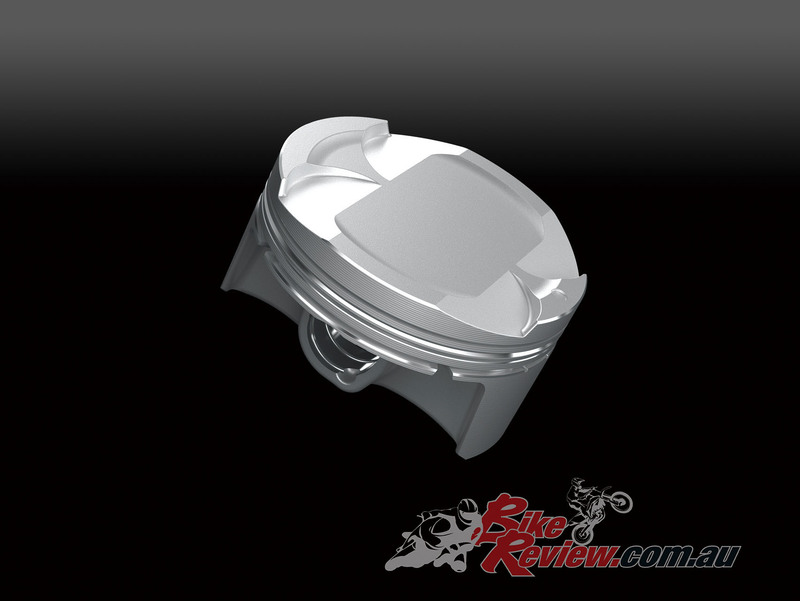 Pistons feature revised crowns and are cast for strength, with Kawasaki claiming a unique casting process that results in similar weight to forged pistons. Cooling is also done by single piston jets, down from two on the H2, due to more effecient combustion and less heat. With less oil being pumped, the oil pump runs at a slower rate, and 500mL less oil is required, further saving weight. Dual secondary balancers ensure minimal vibrations. The revised exhaust features a smaller diameter header pipe, with connector pipes, while the pre-chamber is now double-wall construction, down from triple on the H2. The silencer is also more compact and saves 2kg, with a reverse taper design.The catalysers are also relocated to just aft of the collector pipe, where they warm faster, provide better emission control, and reduce the necessity of ignition retardation. Longer primary gearing is also found on the H2 SX engine, including on first and second gears. Also new on the H2 SX is a redesigned frame to accomodate the greater carrying requirement of a touring machine. The frame’s steering head was moved forward 15mm giving a wider steering angle of 30 degrees, while the engine is tilted two degrees forward. 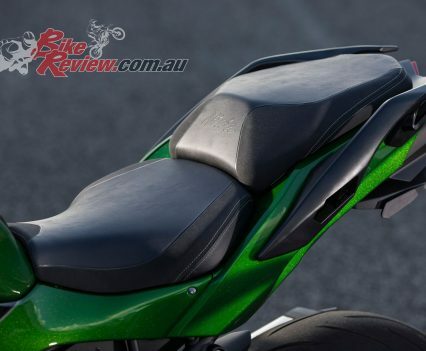 A stronger, longer rear sub-frame enables a total payload of 195kg for two-up riding. 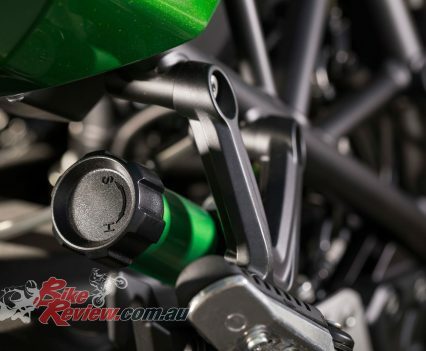 A swingarm mounting plate, as found on the H2, allows the engine to act as part of the frame, with the swingarm pivot through the plate, and the plate mounted to the engine, removing the need for cross members and reducing weight. A single-sided swingarm as found on the H2 is retained, but is 15mm longer. The overall wheelbase is 25mm longer. Suspension is 43mm forks offering full adjustability, while a KYB fully adjustable monoshock also found on the 2015-2016 H2 is also used. A new Uni-Trak linkage is also featured, and is below the swingarm and mounted to the swingarm mounting plate. A remote preload adjuster also offers easy adjustment. 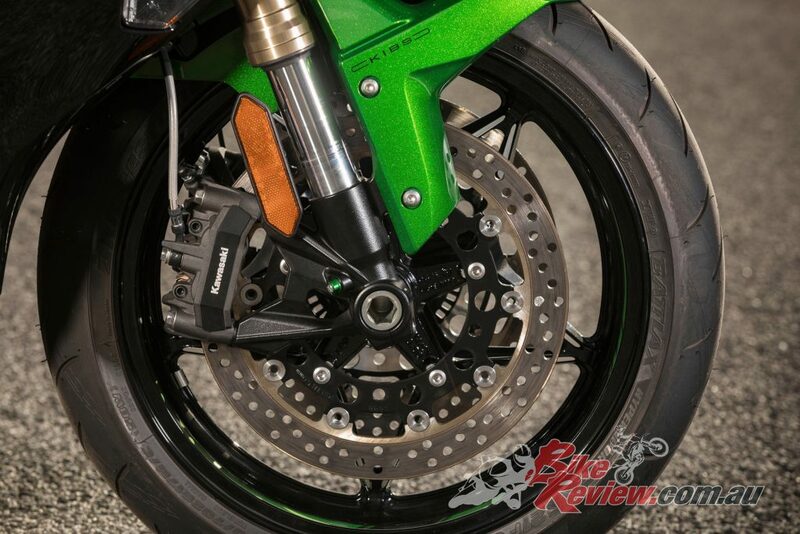 The H2 SX features 320mm front rotors with radial mount calipers, with a 250mm rotor and twin piston caliper on the rear. The SX SE model features braided steel brake lines as standard, while the cast aluminium wheels on the SE also benefit from machining on the spokes and rim tape. 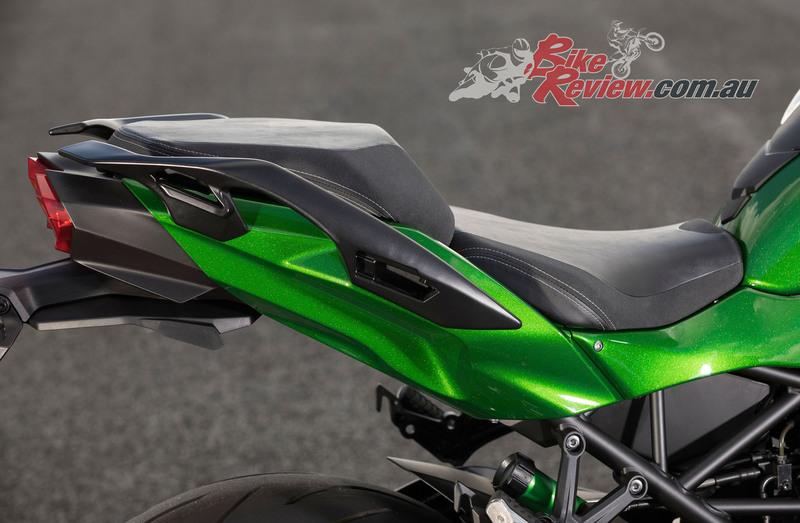 Unlike the original H2, the H2 SX features full fairings, offering greater protection and in part because the H2 SX puts out significantly less heat. The SE features a larger windscreen for additional touring comfort. 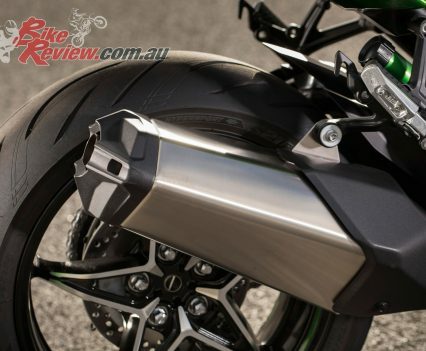 Kawasaki are boasting an even more comfortable riding position than the ZZR1400 thanks to the level of wind protection on the SX. Standard seat height is 835mm with a 820mm Low Seat available, with a comfortable pillion seat also featured, with a wide flat design. On the SE the seats are high grade two-tone leather/suede and double stitched. 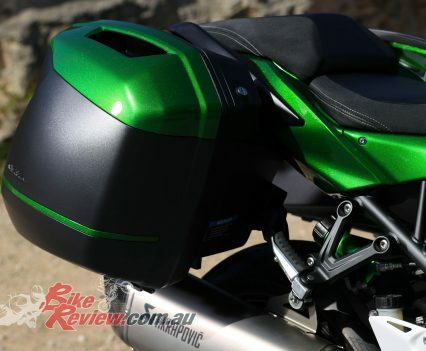 Panniers are also mounted via a seamless system, which is incorporated into the pillion grab rails, with the panniers tested on the German Autobahn to ensure stability and safety. Givi 28L panniers are available, and are colour matched to the bodywork, featuring a one-key system that matches the ignition. 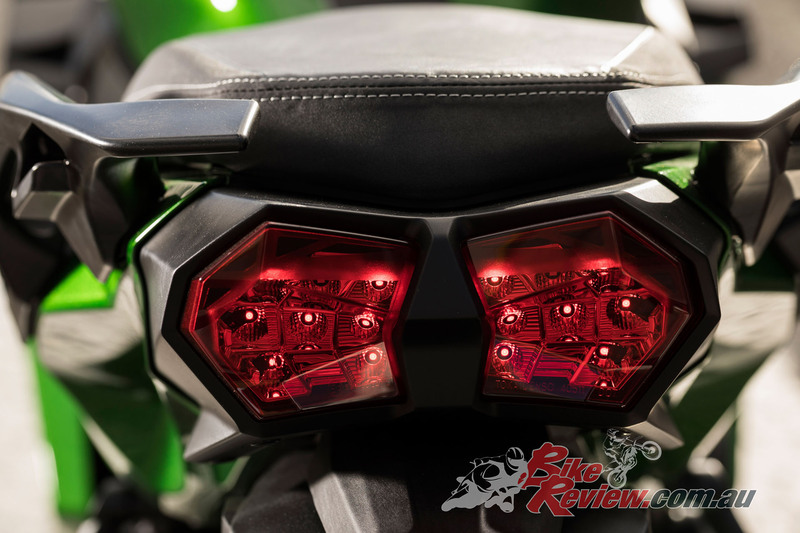 All lights on the H2 SX are also LED, with a compact LED headlight and LED position lamps. 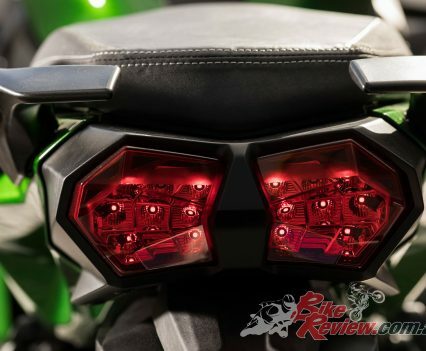 LED cornering lights are also featured on the fairings, which detect lean angle, with three lights on each side lighting up as needed. The rear taillight also features a H pattern in the LEDs, while turn signals are all LED. 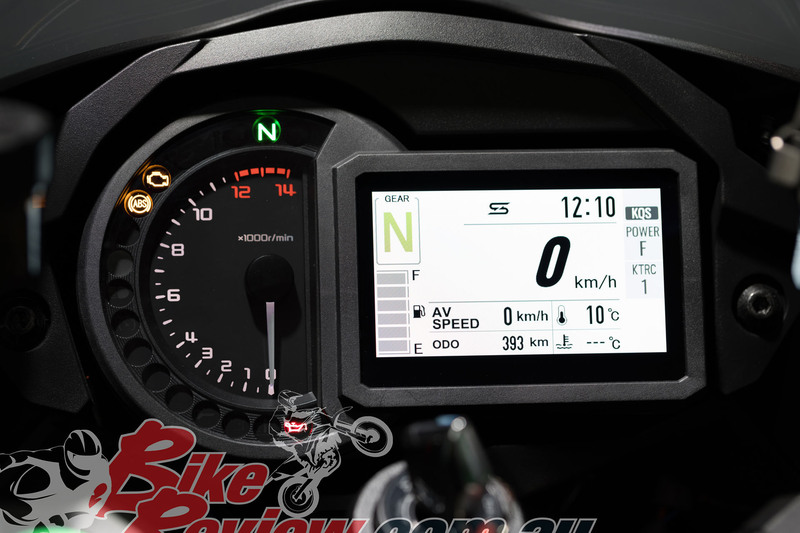 The SE model of the H2 SX also includes a full colour TFT screen, with two selectable display modes – Touring and Sport. 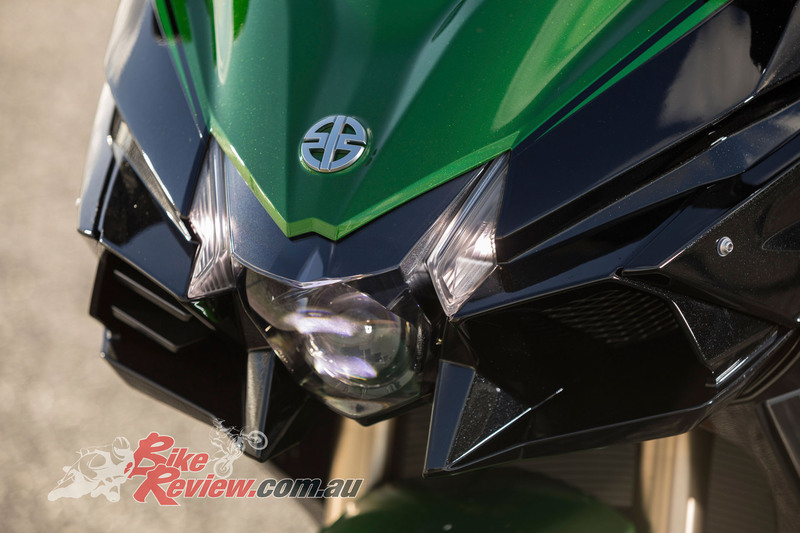 Overtall the new H2 SX weighs 18kg more than the original H2 and fuel efficiency improvements place it now on par with the Z1000SX and Versys 1000, with the H2 SX boasting a 19 litre fuel tank in line with it’s sport touring lean. 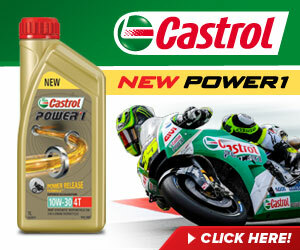 An extensive electronics package is also featured on the H2 SX, with a Bosch IMU communicating with the ECU in what Kawasaki call the KCMF (Kawasaki Cornering Management Function) – Total Engine & Chassis Management Package. The IMU monitors inertia along six degrees of freedomAcceleration along longitudinal, transverse and vertical axes, plus roll rate and pitch rate are measured. 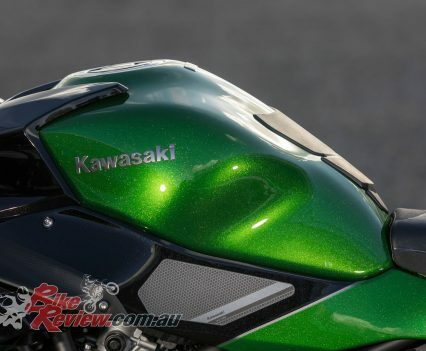 The yaw rate is calculated by the ECU using Kawasaki original software. 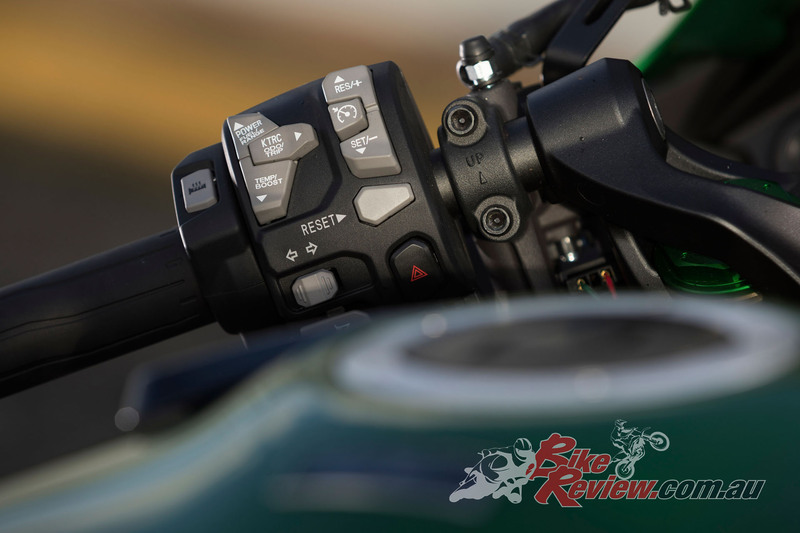 Electronics include Kawasaki Traction Control (KTRC), with three modes, as well as Wheel Lift Control, Kawasaki Launch Control Mode (KLCM) on the SE, Kawasaki Intelligent anti-lock Brake System (KIBS) incorporating cornering braking control. An extensive electronics package is also featured, with additional benefits found on the SE. See below for the full run down. Power Modes are also available with three levels of power delivery – Full, Middle at 75 per cent, and Low at 50 per cent. 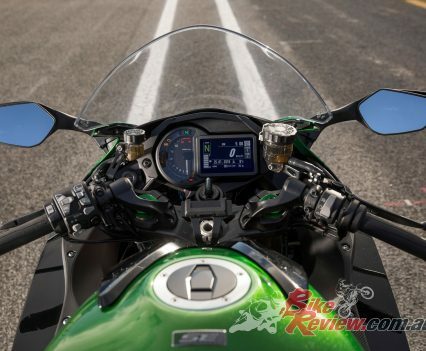 Kawasaki Engine Brake Control (KEBC) also allows selectable engine braking levels. 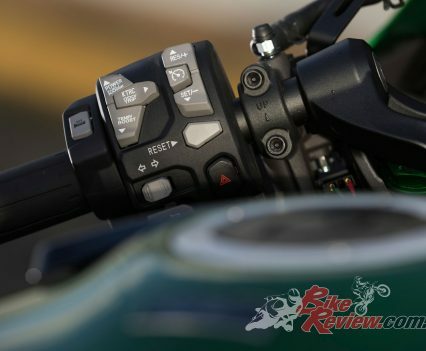 Also standard is the Kawasaki Quick Shifter on the SE model, not operating below 2500rpm, while Electronic Cruise Control is standard fitment, and Kawasaki say it’s a first on one of their sport tourers. The H2 SX is available in Metallic Carbon Gray / Metallic Matte Carbon Gray. 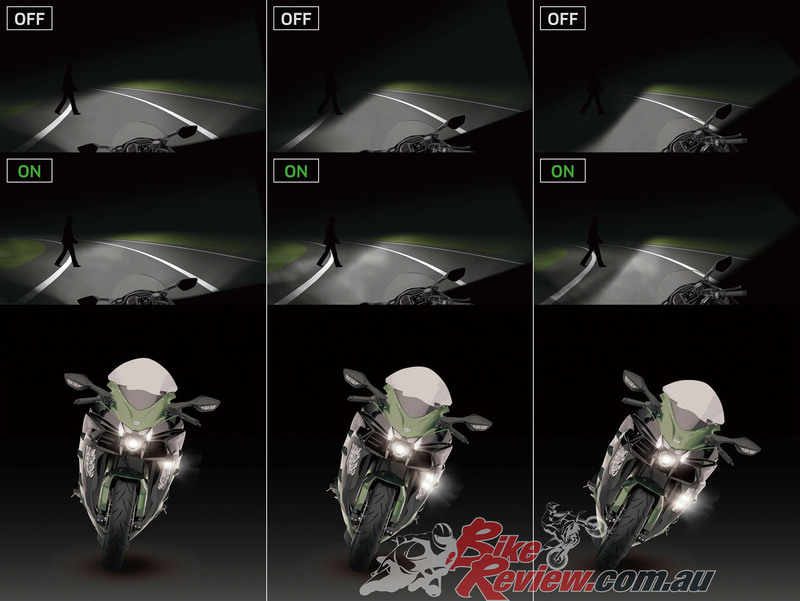 LED Cornering Lights: Each of the three lights, built into each side of the fairing, has a fixed direction and is activated based on lean angle (10, 20, 30 degrees). As the bike leans over, the lamps come on inorder, creating a wider path of light in the direction the bike is heading. 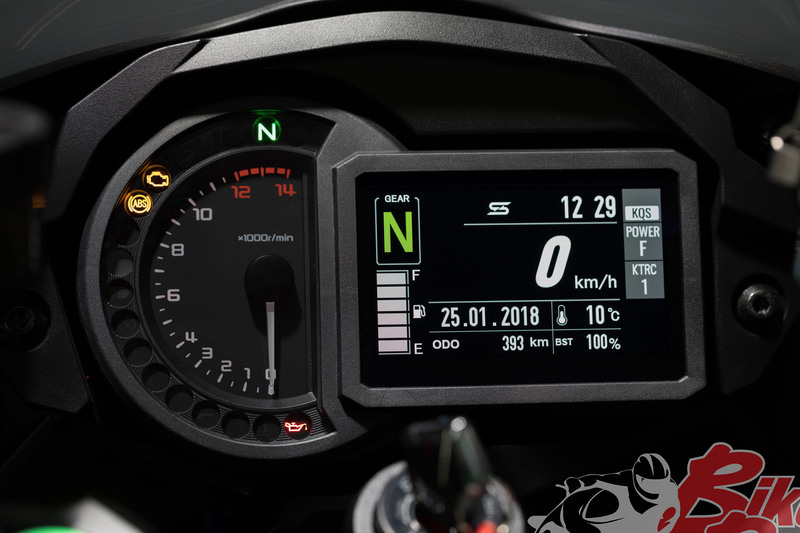 TFT Display: Kawasaki’s first use of a high-grade full colour TFT LCD screen features on the SE model, with two selectable display modes (Touring or Sport) to allow riders to prioritise the information they want to see. 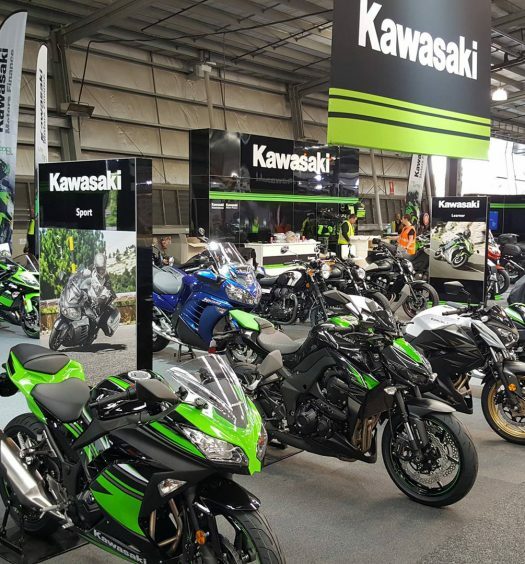 KLCM (Kawasaki Launch Control Mode) electronically controls engine output to prevent wheel spin and minimise wheel lift when launching on the SE model. KQS: The SE also features a dual-direction quick shifter allows both clutchless upshifts and downshifts. Designed foreffective sport riding, street-optimised settings enable operation at rpm above 2500 min-1. 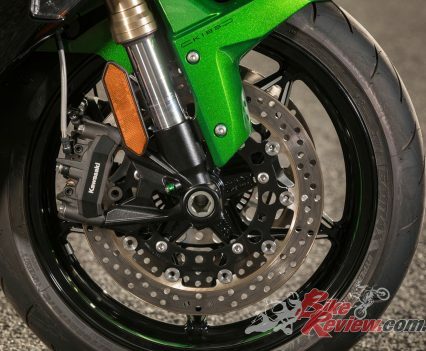 The Kawasaki H2 SX SE also includes steel braided brake lines, machined wheel spokes with clear coat and a rear hub coupling with machined finish. The SE is available in Emerald Blazed Green / Metallic Diablo Black. An extensive electronics package is also featured, with additional benefits found on the SE.